PlayOJO is a top UK online casino, offering over a thousand casino games, from roulette and blackjack to Jackpot Jester and Magic Mirror. There really is something for everyone. PlayOJO prides itself on being “The Fair Casino” with no wagering requirements and no maximum win, even from free spins. It pays out on all wins in real cash and offers an impressive range of perks and bonuses. Get up to 50 wager free spins, 1 with every £1 deposited, up to £50. New Depositing Customers Only. Min. deposit £10. PlayOJO is known for offering a range of bonuses to both new and existing players. The OJOPlus account allows players to earn money every time they place a bet. This applies to all games at all levels, and the amount of bonus money that you can earn is theoretically unlimited. Keep placing bets and the money will automatically be added to your account. You can use it to play, leave it to accumulate in your OJOPlus account, or withdraw it as hard cash. As you play, you will be able to see your OJOPlus money mounting up, and you can hit “collect” and add the funds to your Real Money Balance whenever you wish. There are no restrictions and no minimum amount that you need to reach before you can withdraw from OJOPlus. ClubOJO is another bonus scheme available at PlayOJO. It is by invite only. However, once you’re a member, the more you play, the faster you move up through the levels and earn perks. Eventually, you may earn an invite to become a ClubOJO A-Lister, which gives you a range of benefits, including faster withdrawals, exclusive competitions, luxury gifts and your own dedicated A-Lister Manager. 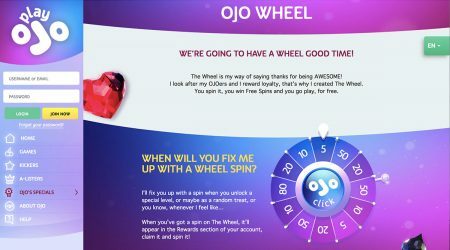 A third bonus offered to all players at PlayOJO is the OJO Wheel, which actually consists of three wheels with different prize levels available. Players get spins on the wheel as part of the OJO rewards scheme. Sometimes, a spin comes through for reaching a certain level on a particular game. Sometimes, it is totally at random. Free spins will show up in the Rewards section of your account. You will need to claim your reward and choose which wheel to spin. Rewards vary depending on which wheel you choose. With the most basic version, you’re guaranteed a win. With the others, there are bigger prizes but no guarantees. New customers at PlayOJO get a welcome bonus in the form of free spins on Rainbow Riches. The value of your welcome bonus will depend on the value of your first deposit. You’ll get one free spin for every £1 you deposit, with a maximum of 50 free spins. PlayOJO has a low deposit requirement of just £10, but you can only claim your bonus of up to 50 free spins based on your very first deposit – so a £10 deposit means 10 free spins, and a £50 deposit earns you 50 free spins. 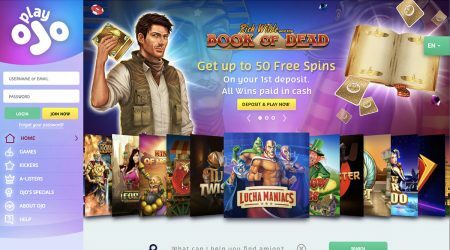 If you deposit £10 and then later deposit another £40, you still only get ten free spins, so consider your options before you make that first deposit. As you would expect, the welcome bonus is only available to new PlayOJO customers opening their first account at the casino. PlayOJO has no wagering requirements. Your winnings are yours to keep and can be withdrawn from your Real Money Balance in cash at any time, as long as you have more than the minimum withdrawal amount in your account. As already mentioned, PlayOJO provides free spins as a welcome bonus, surprise free spins on the OJO Wheel, and promotions and contests through ClubOJO, but the casino has a few other extra promotions to offer players. For example, PlayOJO will give your play a “kick” every day with extra bonuses, promotions, free prizes, free spins and other rewards. These are known as Kickers and can be seen in a section on the left-hand side of the homepage when you’re logged into your account. There are new Kickers every day, so when you see one that you want, you simply claim it and use it. Many Kickers are completely free – others can only be claimed if you are making a new deposit. Some Kickers, such as free spins, will expire after 24 hours, so make sure to use them. 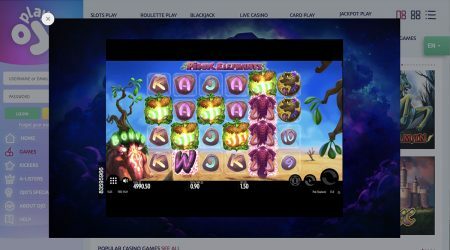 The casino also offers something called OJO’s Reel Spinoffs, which are slot tournaments where players receive spins on a slot game, and any wins turn into points displayed on a leaderboard. The top three finishers win a Free Spins Package. Your Reel Spinoffs winnings will show up in your Rewards section. On top of all this, there is the OJOPlus system already mentioned, allowing players to earn money for every bet placed. PlayOJO offers over 1,000 online games, with different themes, features and payouts. There are a few variations on all the main casino favourites, such as roulette, poker and blackjack, plus plenty of slots (they make up the majority of games available) and some fun table games. 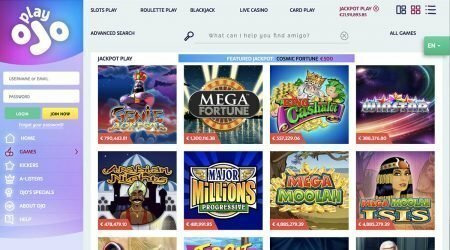 Games are handpicked by PlayOJO from a variety of providers, enabling the casino to offer a big selection of games from a range of different companies. One potential complaint here is that there are actually so many games that it’s hard to simply browse through them all – you would never stop scrolling. There is, however, a useful search function to help you find what you’re looking for, and if you’re a fan of slots, then there’s a handy button to take you to a random slot to try out. Gaming on the go is obviously important to many online gamblers, and PlayOJO provides mobile apps allowing you to play from your smartphone or other device. There is also an instant play setup, allowing you to play directly in your browser from any device. PlayOJO allows you to deposit and withdraw funds using a range of payment methods, including major credit and debit cards, PayPal, Skrill, Neteller and paysafecard. You can link more than one payment method to your account if you want, and there is a quick deposit function allowing you to add funds by credit card while you are playing with a couple of clicks. Obviously, all payment methods are dependent on what is available in your country. There is a minimum deposit of £10 and a minimum withdrawal of £20. As part of PlayOJO’s security system, you will need to upload verification documents the first time you withdraw, which you do within your account by clicking the “deposit funds” button, and then simply follow the instructions. This is where you’ll also find details of which documents they accept. After that, withdrawal is straightforward and usually processed within a few hours, though it can take up to 24 hours. It is, of course, important with online gambling that you can access customer support and get answers to your questions if needed. PlayOJO has a pretty comprehensive FAQs and Help section, where you’ll find answers to most of the common questions that new customers ask. If you scroll to the bottom of that section, you will find options for email support and live chat. Live chat is usually the preferred communication of online gamers, and this is available from 6am until midnight. There is, however, no phone support offered at all, so that could certainly be a drawback for some customers. PlayOJO provides a great all-round experience for online gamblers, especially those who love to play slots but also like the opportunity to try their hand at table games and card games. The website is clear and easy to navigate. The style of its content is friendly and accessible, but you get the feeling that there is a strong emphasis on professionalism and customer satisfaction. As a “fair play” casino, PlayOJO provides a transparency that many online gamers will find refreshing, and we certainly liked the fact that there are no wagering requirements and that there is a fast, easy payout system. Another big plus is the commitment to customer experience, through promotions, loyalty programmes, free spins and contests. We liked the OJOPlus scheme, allowing players to earn cash every time they bet, and ClubOJO is a nice idea. It is important to remember, of course, that all of these perks are aimed at customer retention, and are in the casino’s best interests, but they are well executed and give customers a reason to keep coming back. Customer support is one area in which PlayOJO could, perhaps, improve. Email support is fine, and live chat being available from 6am until midnight is good, but obviously online gambling happens 24 hours a day, and often into the early hours of the morning, so 24-hour chat support would be a better alternative. Some customers might also want to pick up the phone and talk to someone, especially if they have a complex problem, which simply isn’t an option with PlayOJO. Overall, however, PlayOJO provides a good customer experience, a wide choice of games, lots of good promotions, low minimum deposit and withdrawal limits, and easy-to-understand terms for customers.